Often, when I watch a film about ghosts, I like to apply my patented Louise Test™. My wife (and co-presenter of the That Was A Bit Mental podcast) isn’t a massive fan of ghost movies, so usually when I want to watch one she’ll sit at the PC instead and browse the internet. Occasionally she’ll look over at the telly and, should she see a ghost, audibly express her dismay at having done so. That’s when I can tell the film’s ghosts are effective. A Haunting At Silver Falls offers more screen time to its ghosts than any other film in recent memory, except for maybe Casper. And yet, as Louise looked over to the screen numerous times throughout, she didn’t bat an eyelid. And that’s the problem. Not that I’m incapable of terrifying my wife, of course: it would be somewhat concerning if that was important to me. No, the problem is that A Haunting At Silver Falls is about as scary as waking up with a numb hand because you slept on it, then the numbness going away after a few seconds. It tells the story of Jordan, a teenage girl who’s having a prick of a time. Her mum died when she was younger and her dad has recently pegged it too so, orphaned, she heads to Silver Falls to stay with her aunt and uncle, who she never knew she had. Hmm. Being the fun-loving type, Jordan quickly befriends Larry, a young chap so stereotypically nerdy he just about stops short of constantly pushing up his thick glasses. One night, at a party, Jordan and Larry decide to wander the nearby woods, no doubt for a shifty fumble. There, Jordan finds a mysterious ring. The next day, Jordan realises the ring is on her finger, even though she can’t really remember putting it on. Ah well, not to worry: after all, she doesn’t seem to be too concerned, even when she discovers she can’t get the ring off. It soon turns out someone else wants Jordan’s ring, someone of the not-quite-living variety. A ghost, is what I’m basically saying. At night, as Jordan sleeps, the ghost comes into Jordan’s bedroom and tries to pull the ring off her finger, but to no avail. Cue Jordan waking up and wondering why her locked bedroom door is open, her aunt and uncle refusing to believe her, and so forth. After taking an eternity to properly get going, it’s eventually explained that there are actually two ghosts: twin sisters who were killed in the woods and seeking revenge. And they reckon Jordan is the person to help them get it. What we’re dealing with, then, are Sixth Sense ghosts: ones that don’t actually want to harm our protagonist but are actually looking for help from them. It’s probably just as well, because they’re probably the least terrifying ghosts I’ve seen in a while. Dressed in white with creepy faces much like Samara from The Ring (oh, NOW I understand why she found a ring), for most of the film they just stand there. A lot. You know how, sometimes in a horror film, the protagonist will be minding their own business and suddenly they’ll spot the ghost standing there in the corner of the room? And then sometimes they tell someone else, who inevitably can’t see the ghost? Imagine that happenening constantly for about half an hour, in nearly every scene. Whether Jordan’s in her bedroom, or at school, or sitting in a car, or walking past a cinema, or at her friend’s house, or being spoken to by a psychiatrist, there’s always at least one ghost standing in the corner. When the trick isn’t effective the first time around, seeing it fifteen times in succession is just yawn-inducing. It’s a shame, too, because there’s a passable movie in there somewhere with a plot that, while hardly revolutionary, at least keeps you keen to see what happens next. At least, until the twist ending kicks in and sighing commences when it turns out… well, I won’t spoil it, purely because if I fall asleep now I’ll be up all night. I haven’t seen a truly brilliant ghost movie for a while now, and after watching A Haunting At Silver Falls I can safely confirm that statement remains unchanged. That’s not to say it’s terrible, of course, but with no scares, overused ghosts and a twist ending that’s as by the book as a Bible reading, the decent performances alone can’t make this anything other than an inoffensive film you’ll happily watch then forget the next day. 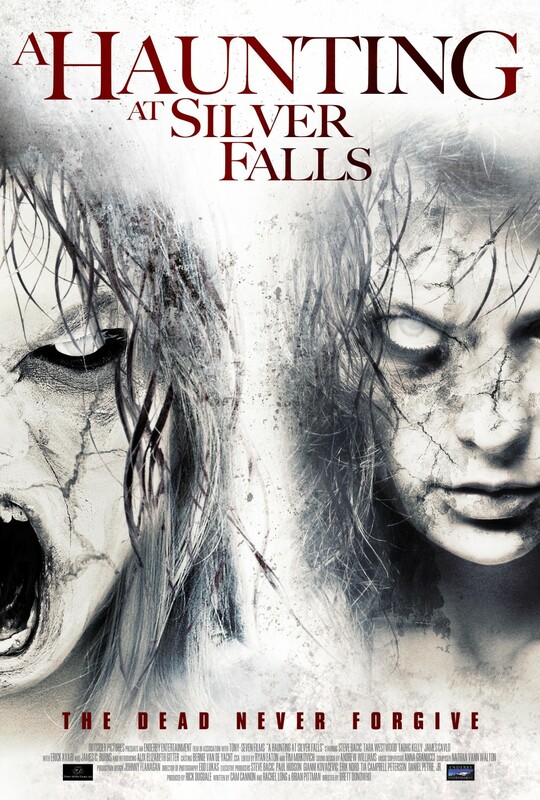 A Haunting At Silver Falls is available on DVD only. Here’s the UK version and here’s the US one. Alternatively, it’s available for streaming on US Netflix. Don’t get me wrong, you might like it! It just really didn’t do anything for me.